He was described by Australia’s official war historian, Charles E.W. Bean, as ‘Australia’s greatest front-line soldier’. Wounded in action eight times and gassed at Villers Bretonneux, he was one of the most famous of all the ANZACS. Once a household name in Australia, his image was used on recruiting posters and magazines, and his exploits featured regularly in newspapers, particularly here in Victoria. In 1915 Private Albert Jacka, a young man from Wedderburn, Victoria, became the first Australian to be decorated with the Victoria Cross, Australia’s highest medal for bravery during the First World War. After enlisting in the Australian Imperial Force in 1914 as a private in the 14th Battalion. Jacka’s battalion landed at Gallipoli on this day, 26 April 1915. Having survived the landing on to the beaches of Gallipoli, which we all now now was one of the greatest military blunders of all time, Jacka came under heavy attack three weeks later on 19 May, 1915, while holding a portion of trench with four other men. He was the last man standing when the trench was rushed and occupied by a band of Turks. Taking advantage of a diversion created by bomb throwers at one end of the Turkish position, Jacka single-handedly recaptured the trench, shooting 5 Turkish soldiers and bayoneting 2 more, forcing the remainder to scramble out of the trench. Jacka who was only 22 years of age, found himself holding the trench alone for the remainder of the night. Jacka settled back into life in St Kilda, Melbourne eventually becoming Mayor of St. Kilda in 1930, devoting his energies to helping returned diggers and the unemployed. Sadly after having survived the atrocities of war, Albert Jacka died from kidney disease 17 January 1932 at the relatively young age of 39. More than 6,000 people filed past his coffin as it lay in state. His coffin was carried by eight Victoria Cross recipients and his funeral procession was led by over 1,000 returned soldiers. Jacka was buried with full military honours in St Kilda cemetery. A commemorative service to honour Jacka is held every year on the anniversary of his death at his grave site, originally organised by former members of the 14th Battalion, it is now held by the local council. In 1982 the St Kilda City Council renamed parts of the busy Lower Esplanade and Marine Parade as Jacka Boulevard. 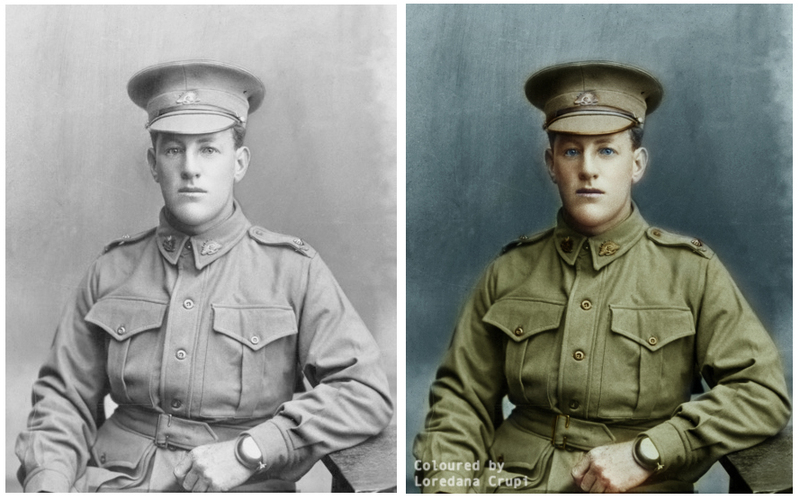 This entry was posted in Australia, Colorization, Colourisation, History, Photography, World War 1 and tagged Albert Jacka, Battle of the Somme, Bullecourt, Charles Bean, Charles E.W. Bean, Gallipoli., Loredana Crupi, Opus Loredana, St Kilda, Victoria Cross, Wedderburn. Bookmark the permalink. impossible to understand what these guys went through, so many hero’s and this guy sounds cream of the crop.